Limo Service Baton Rouge - Renting A Limo For Prom? Remember These 5 Things! Prom is a special night for everyone. Top-notch tuxes and trendy dresses adorn the ones we love the most, our children. Prom is a night for memories, from the moment your son or daughter first come downstairs with their outfit on to the text that says, “On my way home.” Not only is prom a huge event for your budding adult, but it’s also the night they’ve been waiting months to experience. If you think back to what all went into preparing for prom, there’s a long list of must-haves. Aside from tuxes, dresses, hair, shoes, and more, a limo rental is mandatory. At Acadiana Courier, we offer limo service to prom events in Baton Rouge. We’re the leading limousine and party bus rental company in the area. 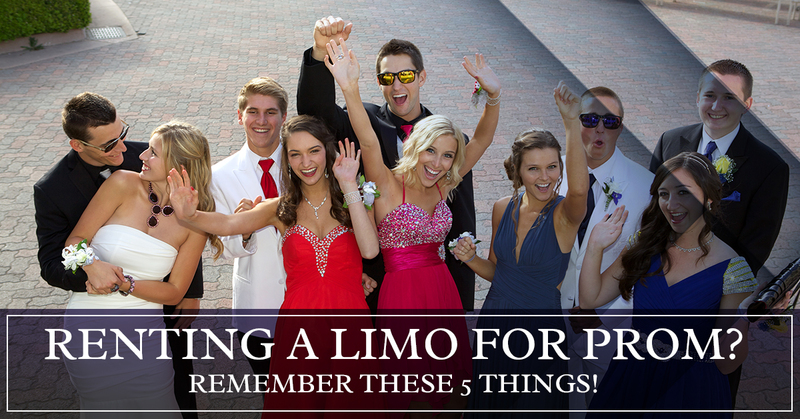 In this post, we’ll share five tips to remember when renting a limo for prom! Similar to a prom dress or tuxedo, you want to make your reservation early. Although you may think prom is a small event in Baton Rouge, there are only so many limos available for rides on the special night. Reserving your limo rental early guarantees your prom kings and queens have a ride to and from the event. Don’t be the parent who waits until the last minute to try and find a limo and can’t. Furthermore, early reservations tend to offer discounts. Make sure and ask about them! First, check if the limo rental service you’ve chosen in Baton Rouge is permitted to operate there. It can be enticing to choose the best deal and ignore the legality. Consider the limo being pulled over by the police and “grounded.” You don’t’ want your prom queen or king stuck on the side of the road desperately searching for a ride to their special event. Second, ask if the limo rental service carries insurance. Take their policy number and confirm that the insurance is real. It’s simply one more step to ensure the safety of your queen or king. Finally, discover if the potential limo service company is associated with any industry related organizations. In most cases, a limo service will be a part of the National Limousine Association or something similar. This is simply a quality of service check on the company. Tip #3 – Take A Test Ride! That’s right! Ask the potential limousine rental company if you can take a test ride to get a feel for how they operate. You may need to pay a minimal fee to discover if this company is the best for prom night, but it’s worth the expense in lieu of not knowing until the limo arrives on prom night to pick up your king or queen. You’ll want to check the seats, electronics, doors, windows, and more to ensure the safety and functionality of everything. Yes, this is important. Make sure and get the fine details on what the limousine rental actually includes. First, you want to make sure it includes a to-and-from trip. Second, ask if it includes beverages. Finally, you want to clarify if the limo will make multiple stops between the event and the final destination or not. Determine the rates before you sign any contracts. Never sign a contract if the rates are “variable.” Limo rental services will offer you a flat rate or an hourly rate you can expect to pay. You want expected expenses from your prom limo, not surprise charges to your bank account. We are the leading tux rental and limo service in Baton Rouge. When it comes to prom limos, we are the company to call. Our dedication to our customers is beyond reproach, and we do whatever is necessary to guarantee satisfaction. Choose a safe, reliable limo rental service. Call us today!